There’s a lot of buzz about The Martian, and for good reason. Published in hardcover on February 11th by Crown Publishing, it debuted at number 12 on the New York Times Bestseller list for hardcover fiction. This is the old cover of Weir’s self-published book. But here’s a twist: The Martian was actually originally self-published in 2012. According to a Wall Street Journal article, Weir posted the book for free on his website, but then started selling on Amazon (at the minimum price, 99 cents) at the request of fans. It quickly landed a top spot on the bestselling sci-fi list. Our review of The Martian rated it 5 stars and included a public apology to an unnamed barista for listening to the reviewer rhapsodize about it. Crown Publishing purchased the rights to the Martian in March 2013 for six figures. Twentieth Century Fox has also optioned the film rights and hired Drew Goddard to direct. Shelf Awareness posted an interview with the author, Andy Weir on February 18th. Want to live like Mark Watney (protagonist of The Martian)? 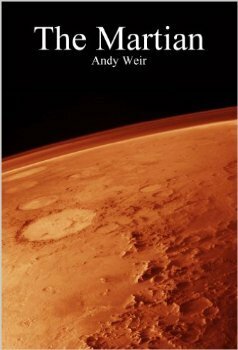 Andy Weir provides 8 tips for Surviving on Mars. It’s not about aliens, its about an astronaut!